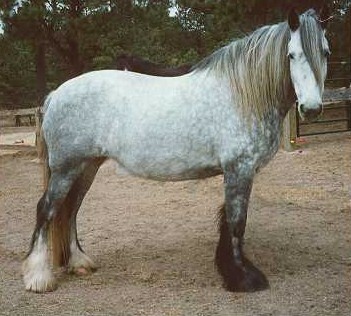 Maddie is a gray 1991 English Registered Shire mare. This 16.3 hh, 1700 lb mare is by Ladbrook Aristocrat (by Ladbrook Invader, the 1980 Guiness Book of Records "tallest living horse" at 19.2hh) and out of Rhyd-Y-Groes Silver Maid (By Rhyd-Y-Groes Premier King). Maddie is broke to ride, and her favorite Hobbies are eating, and getting good scratchy from whoever will oblige her. She loves attention! Thanks to Jeff and Christine Bartko of Black Forest Shires, Colorado for allowing me to display this photo of their lovely mare.